Debunking Christianity: What Would Christianity Have Without Its Myths? What Would Christianity Have Without Its Myths? 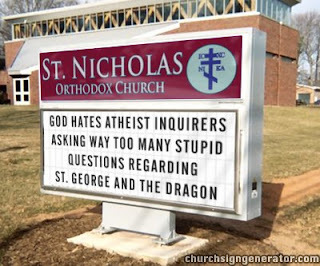 Christian "truth" is fabricated and propagated by Christian tradition and one of my favorites deals with my experience at Saint George Greek Orthodox Church here in Greenville, S.C.
On the wall in front of the church is a large iconic mural of a knight on a white horse who had just slain a dragon. The guide told visitors that the icon depicted Saint George as a righteous knight who killed a dragon (a creature pictured with bat like wings and a snake like neck and head) who had terrorized a village for a number of years. The guide told us, by killing the evil dragon, George became a Saint: Thus the name of Greenville’s Saint George Greek Orthodox Church. 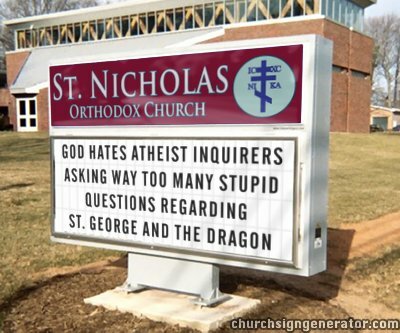 After considering the logical reality behind this dogma, I decided to call Saint George Greek Orthodox Church and ask if they really thought dragons existed. The church’s secretary (who was herself a Methodist) told me she would have to refere this question to the priest (Father Tom) who was out of town, but she would have him call me. One morning (several weeks later) the phone rang and a man identified himself as Father Tom from St. George’s Church (who seemed to have been given the impression that I was a potential member). Harry: Could you tell me about Saint George Killing the dragon. To which Father Tom basically recounted what the church guide stated about the miracle of St. George killing the dragon that had terrorized a village. Harry: So there was a real flying dragon that terrorized some ancient village? Father Tom: Well, the dragon which St. George killed was, in reality Satan, and by killing Satan; George freed the village from the dragon’s destruction. Harry: What you’re telling me then is that Satan is now dead? Father Tom: No! Satan is not dead! St. George killed the dragon just as the icon depicts. Harry: (Thinking I must have missed something) . . . But was there a real dragon that flew and terrorized an ancient village? Father Tom: (Now getting angry) Who are you? You’re not a Greek Orthodox are you? Harry: No (I decided it was not a good idea to tell him I was an Atheist). Father Tom: I’ll tell you one thing! You and the rest of you so-called Christians will stand before Christ at the judgment and there you WILL give an account to him as to just why you are not Greek Orthodox (with that final comment, he hung-up)! Frankly, I knew no more about the matter of St. George and the flying dragon than before he called. (What I had done was to not only questioned religious dogma, but by pressing Father Tom on the dragon, I was then given the wrath of God and Hell as a future judgment for my soul (par for the course in Christianity)! I work with a former Southern Baptist (I'll call him Jim) who joined St. John of the Ladder Orthodox Church which also venerates St. George. I told Jim about my experience with Father Tom and I asked him how he dealt with questions regarding St. George and the dragon? Jim told me he hadn’t really thought about it. A week later, I got an email from headquarters telling me Jim had filed a formal complaint with them in that I was harassing him over his religious beliefs and it would be in my best interest not to bring the matter up again with him!